Severe storms raced across the deep south Saturday,with large and destructive tornadoes, flooding rainfall, large hail, and damaging winds. Tornadoes touched down from Texas to Mississippi through the day. 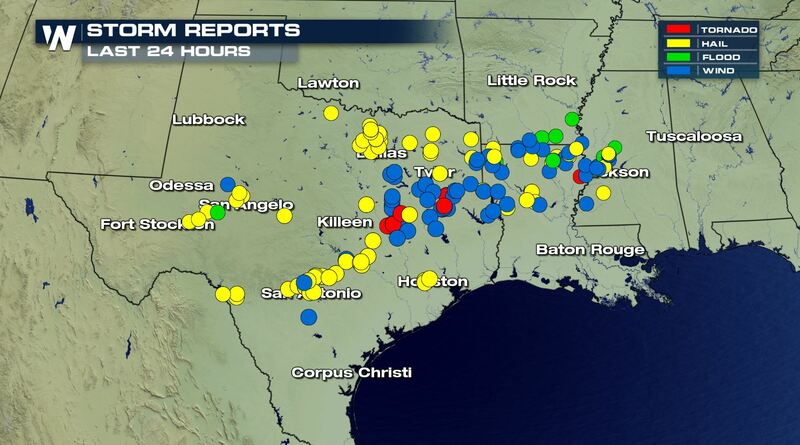 Severe storms fired up early Saturday morning across Texas. 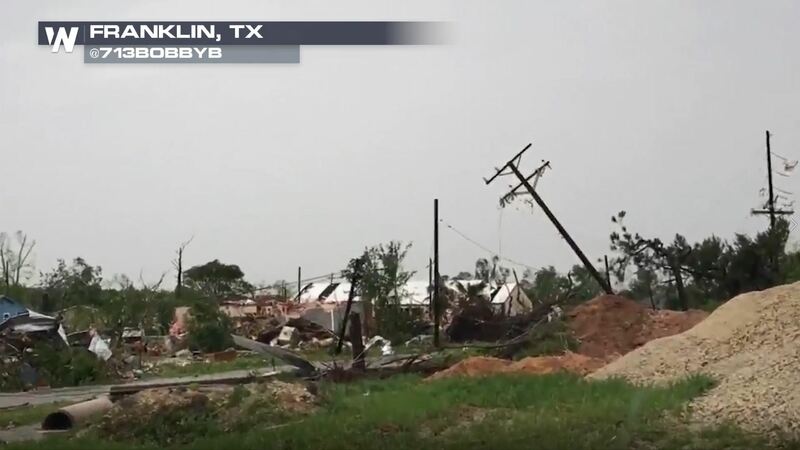 Large, damaging tornadoes first occurred in Texas, including the communities of Franklin and Alto. The National Weather Service reports a large tornado destroyed several buildings in Alto. In Franklin, the preliminary damage survey from NWS Fort Worth estimates an EF-3 tornado hit around 11am CT with winds near 140 mph! As of Saturday evening, there have been numerous injuries and at least 3 fatalities due to storms Saturday. One tornado hit the city of Vicksburg, MS, tearing apart buildings and scattering debris throughout the city. Early in the day, some storms produced large, damaging hail up to the size of ping pong balls. In Helotes, TX, the hail was captured on video and sent in to WeatherNation. As darkness fell, storms continued to press east into Mississippi. A tornado warning was issued for Starkville, MS, including the Mississippi State Campus. No damage was reported on campus, but heavy rain did lead to flash flooding. Numerous storm reports covered the southern, varying from damaging winds, tornadoes, and large hail. Areas of flooding also hit parts of northern Louisiana, Arkansas, and Mississippi as heavy rain developed in thunderstorms, falling on already saturated ground. Severe weather will continue into Sunday morning. Large hail, damaging winds, and tornadoes will continue to be a threat, even during the overnight hours. 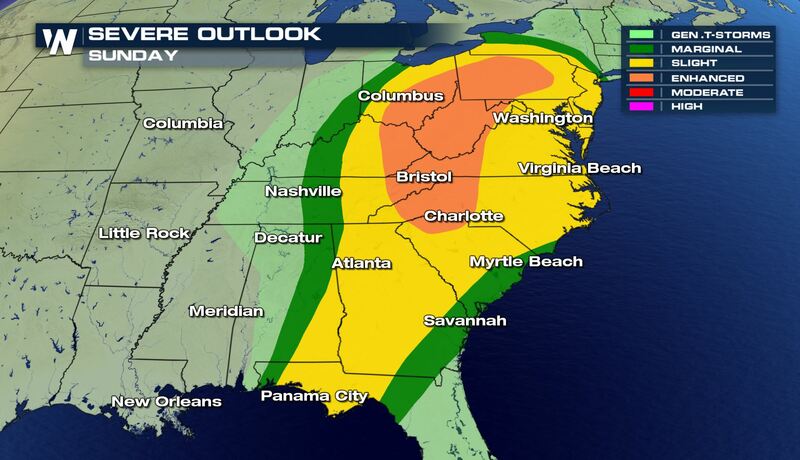 The severe threat continues Sunday for many, targeting the mid-Atlantic and southern Appalachians. Click here to see the full story and timing of Sunday’s severe weather threat.